TARRC were pleased to exhibit for the second time at AUTOPROMOTEC 2015, Bologna, Italy, from 20th May - 24th May 2015. Exhibiting as 'Malaysian Rubber Automotive Products' and based in Hall 18, which is for spare parts and components, stand B22 was well placed to receive interest from the Italian and other European visitors. Extended exhibition area: 157,000 square meters, 30,000 of which were outdoors. The next Autopromotec will take place at Bologna’s exhibition centre from 24th - 28th May 2017. 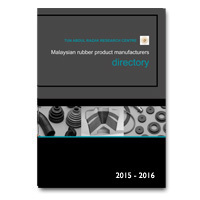 If you are looking to source high quality, competitively-priced rubber-based products and were unable to make it to the exhibition, then just let us know and we can send you your FREE 2015 Directory of Malaysian automotive product exporters of parts, components and materials suppliers. Malaysia is a global supplier of quality rubber and rubber-based products and its manufacturers are backed by two R&D centres of excellence in Malaysia and the UK. Here at the Malaysian Rubber Board UK, we can supply details and advice about the numerous Malaysian manufacturers exporting rubber products worldwide. Alternatively, if you are looking to transfer your own manufacturing operations overseas, why not come and talk to us and learn more about the many incentives and attractions Malaysia has to offer. Consider for the first time Malaysia as your potential trading partner. If you would like to take advantage of TARRC's in depth knowledge of the manufacturing industry in Malaysia and what it can offer you, please contact us. If you were unable to make it to the exhibition but still want to talk to us and see what makes Malaysia such an exciting business partner then please contact David Cawthra or Gail Reader.